Whether you are just thinking about a new concrete garage floor or ready to start planning a new one, you probably have a lot of questions. Sure, you might be satisfied to call a concrete contractor and let him tell you what you need. Call several contractors, however, and you are likely to get several different ideas about what you need with just as many different estimates for what it will cost you. That's when it pays to do a little research. It always makes sense to understand as much as you can about a home remodeling project, whether you plan to do it yourself or pay someone else to do the work. When searching for contractors, you need to be able to ask good questions and to recognize when the answers you're receiving don't add up. Lousy concrete slabs are all too common. Slabs that develop cracks are probably the biggest headache, and the folks who pour such slabs are prone to say things like "concrete is always going to crack." Don't believe it. Good concrete slabs in garages will hold up to all of the weight they need to bear, through hot and cold weather, and for many long years with little if any evidence of cracks. We have a garage slab like that. It was poured over 50 years ago, and it is as solid today as it was at the advent of the television age. Old habits die hard. Building codes used to stipulate that the floor of an attached garage be four inches lower than the floor level of the house. The rationale for requiring this little step was that it would prevent spilled gasoline, gasoline vapors, and carbon monoxide from getting inside the house. Today's residential building code does not include this requirement (presumably, cars are less likely to leak these days), which means that an entire house (garage included) can be set on a concrete slab poured at one height. But there are still a lot of contractors and building inspectors who are stuck in the past, suggesting or insisting on a four-inch step, which costs more than a level slab. If you run into one of these folks, feel free to question their wisdom and request that they produce evidence that this is a legal necessity. It still could be legally required by local building codes, but it is not a requirement listed in the International Residential Code, which serves as the model for most local and state codes. The biggest threat to a concrete slab in the garage comes not from what gets built or parked on top, but what might move below. If the soil or base beneath the slab shifts or settle, the result can be a cracked slab. Good ground preparation starts with removing the topsoil. Then, if the soil has not previously been "disturbed" (i.e., dug up), a four-inch layer (minimum) of gravel or stone should be added. (Soil that has been dug up before should be compacted.) The gravel or stone also needs to be compacted. Vapor barriers (essentially, thick sheets of plastic) are often not required, but you really should insist on one. It's an inexpensive bit of insurance against water moving up through the porous concrete, condensing on the surface and damaging items placed on the slab. Vapor barrier products manufactured specifically for use under concrete are the best choice. More water makes for easier pouring, which is why some contractors try to water down the mix that arrives in the truck. The problem is that adding water can also make for a weaker slab. Contractors can add plasticizers to the mix that create an easier flowing mix without compromising the compressive strength. If you live in a cold climate, your concrete mix should probably include air-entraining agents, which limit damage to the slab through seasonal freeze-thaw cycles. Fiber reinforcement is another inexpensive product that you should insist on. The fibers are mixed in with the concrete and produce a stronger slab. Wire mesh or thick reinforcement bars ("rebar") has long been a component of concrete slabs. However, with proper ground preparation, a good concrete mix, and sufficient expansion joints, it really isn't necessary. Still, many contractors continue to add the cheap insurance offered by reinforcement. If the reinforcement is to do its intended job, it needs to rest in the middle of the slab, not on the bottom. That means that it needs to be anchored in the ground well enough to stay put when the concrete is poured. Many people understand that wood shrinks and expand as temperature and humidity ebb and flow through the year. But the same thing happens with concrete. That's why it is necessary to include expansion joints along the edges of the concrete garage floor as well as around posts or other protrusions in the slab. The resilient material used in expansion joints absorbs any expansion, thus reducing stress, yet fills that joint when it contracts. Once the concrete has been poured, it needs to be leveled and smoothed. Expansion grooves should be cut into the wet concrete to provide additional crack resistance. Then, the new slab needs to be left alone. Concrete doesn't dry out; it undergoes a chemical curing process that creates a dry, solid mass. The top surface needs to remain wet while the curing process takes place. Contractors often spray curing compound on top of the slab or cover it with sheeting to reduce evaporation. You can also offer to spray a little water on the slab every day while it cures. 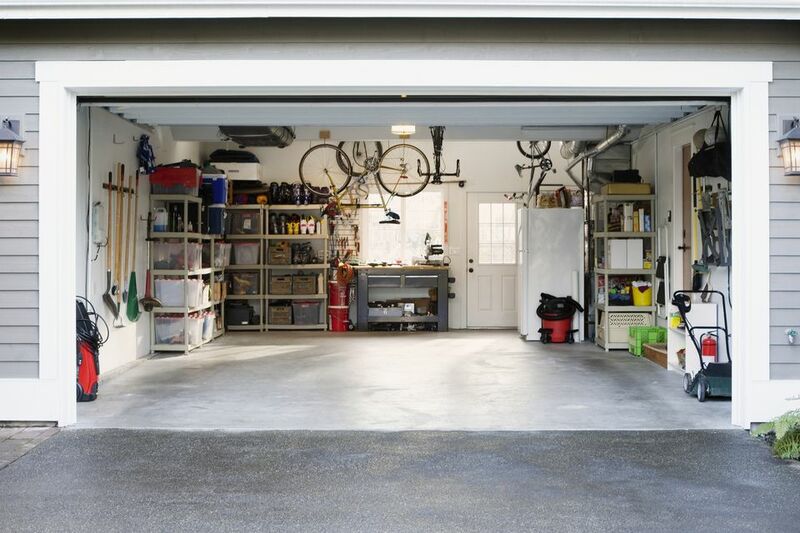 Should You Convert Your Garage Into a Room?